Christopher Nolan, along with his brother Jonathon as writer, has proven time and again his knack for deep, complex films filled with an incredible visual flair and a penchant for entertaining. With The Prestige some of his themes become a little too obvious, but as a multi-layered thriller/drama the film has many secrets in store. In what could easily be dubbed Batman vs. Wolverine, if not for the trappings of a sumptuous period piece, The Prestige features both Christian Bale and Hugh Jackman as leads, each afforded nearly equal sympathy and screentime. Bale takes on a Cockney accent, which is a jarring switch from Bruce Wayne’s husky growl though it is much more native to him than an American accent is to Hugh Jackman. The pair of them star as feuding magicians in late 19th century London. Their lives involve an incredible amount of secrets, many of which they cannot even tell their loved ones. The game is about competition, but even more-so about one-upmanship. At least for Alfred Borden (Bale), who is worried more about out-magicking his competition than Robert Angier (Jackman), who seems to genuinely take pleasure in delighting an audience. Angier yearns to make them wonder about the world, question whether there is something more out there than the simple and miserable existence they know and feel everyday. But it is not just secrets with which the magicians are concerned. Both are hopelessly obsessed with their craft, and in constantly pushing the boundaries they both end up losing everything. There are secondary characters, but they generally serve to highlight the motives and obsessions of the two magicians. Angier has a wife (Piper Perabo), and then later a lovely assistant (Scarlett Johansson). Borden has nothing, then later a wife (Rebecca Hall) and a young daughter (Samantha Mahurin). At the beginning they both have Cutter (Michael Caine), a mix between Q and Alfred, Batman’s butler. Cutter’s primary challenge is crafting new magic tricks and equipment. But the beginning is hard to discern, as Nolan confounds chronological narrative once again. While not as serving to the story as the similar technique is in Memento [review here], it provides additional suspense and forces the viewers to more actively engage their minds. For a movie as deep as The Prestige, this is not a bad thing. It is rather interesting to note how the magician’s rivalry so closely matches that of Nikola Tesla and the nefarious Thomas Edison. It is well known that Edison attempted to discredit Tesla’s alternating current by frying an elephant with it, but even that pales to what Angier and Borden do to each other. It is even more fun that Nikola Tesla (David Bowie) appears in the film, in a vital role as a magician of nature, and is hounded by Edison’s hunting dogs. The production is rather marvelous, with detailed settings and a wonderful art design. The acting is effective and experienced, though the presence of two such familiar faces is, at times, distracting. Johansson manages to blend into the background much of the time, except for when her bosom is pushed to within striking distance of her chin. Caine brings a dignity to his role befitting an English creator of magical acts. The film’s only technical faults involve a bit too much slack with the pacing; a little tightening would have been beneficial. Most disappointingly, the ending goes to great lengths to make everything crystal clear, as if it were elucidating the plot for audience members who weren’t paying adequate attention. They give away the secret, as a magician must never do, after presenting a fitting prestige. The mystery is destroyed and the audience has no need to explore the story further. Nolan always works with rather complex themes, and The Prestige is no exception. It almost seems as though all of his characters are burdened with great secrets. Memento’s Leonard Shelby has such a terrible secret that he tricks himself into believing an alternate turn of events; Bruce Wayne is crushed by the weight of his secret identity, one that causes great pain for his loved ones and innocent civilians. It has been too many years since I’ve seen Nolan’s first film, Following, to elaborate on its themes. The Prestige reminds the viewer that there is more out there than is immediately obvious, pointing toward a greater power in a few different ways. Borden and Angier’s tricks make the audience believe that more complicated forms of existence are beyond their grasp, but when faced with actual science and the complexity of nature (even if the details are stretched slightly) even the magic-makers themselves are humbled and awed. The Prestige will work for more than fans of Bale or Jackman, though many viewers may be interested in the eye candy the two provide. But they would be missing the point. 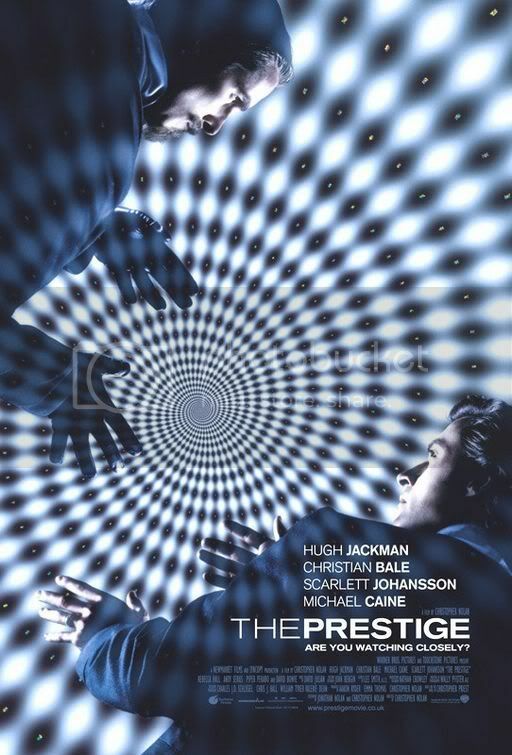 The Prestige is complex and detailed, artfully crafted to explore a wide variety of themes. Like Nolan’s The Dark Knight proved, a film does not have to require you to check your brain at the door to both entertain an audience and make a large amount of money. This entry was posted in 3 pirate flags, 3.5 stars, Movie Reviews, P, Pirate Flag Rating, Star Rating on April 9, 2010 by Tim Irwin.